Yes, another reality TV show has hit the airwaves. But this time, no one gets fired, punk’d or voted off an island. Instead they get...help. Random-1 premieres Tuesday, November 1 on A&E. Further details on the show can be found at the official web site. Random-1, which premieres Tues. Nov. 1 on A&E, chronicles two “Grass Roots Philanthropists” named John and Andre on their attempts to find individuals at random and help them with improving their lives. They do not just hand out money to anyone who begs for it on the street. Instead, they walk up to people with a camera crew in tow and interview person after person until they find someone with a conflict that can be solved. Meanwhile, a production crew in a well-equipped RV nearby is ready to answer cell phone calls by John on how they should find contacts to help their new quest while Andre breaks the ice with their new friends. In one episode, John and Andre encounter Jan, a man who once suffered a nervous breakdown but gets by on playing music for his church. His problem is that he cannot get his keyboard to work. In the same episode, they also meet a young woman named Amber who was once an exotic dancer but now aspires to be a model. The two hosts decide to find a place to repair Jan’s keyboard while trying to set up an job interview with a modeling agency for Amber. The show follows their progress in short snippets that are effective enough to keep our attention without letting our minds wander. The crew does not get too close to these people since it is a simple act and not a major intervention that drives the show. John and Andre did get Amber the interview, but how far she goes from there is up to her John tells us. The purpose of “Random 1” is not to be “good” or” entertaining” but to show how people will react when presented with some interesting propositions. How John and Andre decide whether someone is worthy of their help is mercifully edited down to a few icebreaking questions. It would be hard to say no to two complete strangers who walk up to you with a TV crew but hard to tell your life story to millions of potential viewers. Give credit to John and Andre for making this easy not only on their interviewees but on the viewers as well. Nothing is perfect, and at times it is far from smooth. 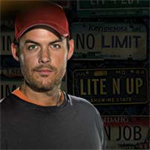 The show uses a “warts-and-all” approach by showing John, a self-described uptight white guy, bicker with Andre, a very loquacious African-American. Much of their work depends on traveling in a dilapidated pickup named Jackie, and John often berates Andre on the condition of his truck and his driving skills. But it is good-natured ribbing since it shows that even society’s greatest helpers could use some help themselves. Andre does talk a lot, but John does get on his case much more often that he should. And their supporting cast who uses the resources of their souped-up RV (which has mechanical problems of its own) to find contacts for the samaritans could use a little social refining themselves. Random 1 might be arriving a year or two too late for its own good now that the reality show interest is ebbing, but it might be different enough to attract viewers tired of of over hyped celebrities who need reality shows to resurrect their stagnant careers.